In a world where the #MeToo movement has made such a huge impact, more and more people are becoming aware of the importance of embracing the feminine in our world. 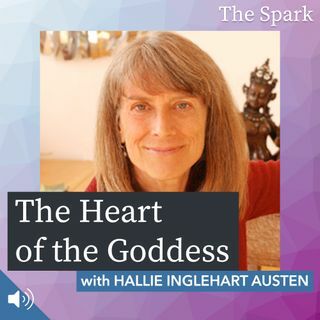 Join me this week as I talk with author Hallie Iglehart Austen about the myths, and history of the divine feminine and her newly re-released book, "The Heart of the Goddess: Art, Myth and Meditations of the World's Sacred Feminine". It's an important conversation that empowers all listeners, male and female ... See More alike. The Spark With Stephanie James is supported by its listeners, and by Audible.com. With over 180,000 titles to choose from, Audible.com allows you to listen to an immense library of books for every taste on your iPhone, Android, Kindle, tablet, or computer, including Resilient by Rick Hanson and Molly’s Game by Molly Bloom. Audible.com has a special offer for listeners of The Spark which includes a free audiobook of your choice and a 30-day free trial. Learn more and get your free audiobook now at https://thesparkpod.com/audible.